As always the cards that I am working with today are showing me so much truth. They never cease to amaze me. I’m so busy at the moment rushing around with work plus trying to think about lots of ideas about the best way forwards for this year and the next few years to come. Sadly I am in such a rush I am not finding the time to think clearly. I also have a very creative feeling around me and I’m almost deliberately not finding time for it as I have always been told in the past I am not creative. All silly but true. Anyway I know if I make the time to talk with my guides the answers will be there. 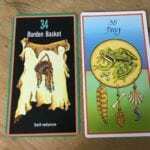 So the cards really made me smile this morning as the Burden Basket is all about self reliance, letting go of burdens by trusting our abilities to find our own answers. Relying on ourselves and our connection to spirit to find the answers. How true and appropriate is that today. To add a bit of extra guidance I shuffled my other deck and out fell Frog. This is all about cleansing, using water to find that clarity of thought and relaxation to allow the thoughts to flow thereby riding yourself of distractions and replace the mud with clear energy. Just what I need!! I hope these cards will make you smile and will possibly bring clarity to your day too. They certainly worked for me and now I am off to meditate, talk to my guides and clear my cluttered head to see the way forwards. Previous Post: Alternative versus orthodox medicine – can they work together?